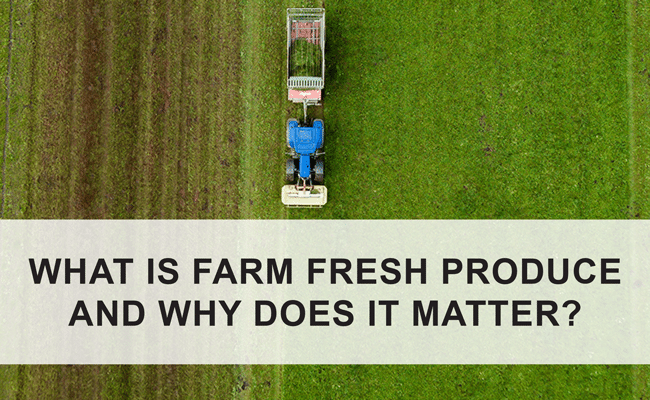 What is Farm Fresh Produce, and Why Does it Matter? What comes to mind when you think of farm fresh produce? Does it bring to mind the simple pleasure of choosing a pint of local strawberries to take home, of deciding which pumpkin most clearly says ‘pick me!’ Or is it the knowledge that you’re choosing something deliciously good for your health, your hometown and your neighbours? Local food is commonly defined as produce sold within 50 kilometers of where it was grown, but for some it also means food grown by people they know and can talk to at the farm market; food that supports small-scale values and a community-based focus. The emphasis on what is in our foods, on where it is grown, how it is grown, and how that impacts the environment has become more mainstream in recent years. This is a change for the better, because our food has the power to improve our health and well-being as well as the our environment. It’s called farm fresh produce for a reason! Locally grown foods have a leg up on the competition when it comes to both nutritional value and taste. Once picked, fruits and vegetables begin to lose that nutritional value and so the longer they wait in storage the less rich in vitamin C, E, A and B they will become – so while that produce sits inside trucks and warehouses it’s losing that magic green power. Local farms are able to allow produce to ripen much longer than imported, which adds to the nutrition value immediately. Also, how produce is handled after being picked also plays a part in its nutritional value; rough handling, mechanical harvesters or long transport can combine to reduce the quality, taste and nutritional value of fruits and vegetables. Water usage is a major environmental topic that many Canadian farms focus on. The use of drip irrigation allows us to deposit water directly to the plant’s root, thus minimizing the amount of water required. In addition, keeping the plants dry aboveground reduces leaf disease and fruit mold which helps us in our quest to reduce pesticides. Choosing food grown from farms in Barrie also helps to reduce your carbon footprint in two main ways. The fewer kilometers your food has to travel from the field to your plate, the fewer transportation emissions are in our air! Local farming also helps to promote the preservation of our green spaces by encouraging youth to continue farming traditions, or even start their own local farming operation. Local farming is just as important today as it was hundreds of years ago and though many of the reasons are different, many of them remain the same: our health, a connection to one another and our land. There’s no better feeling than biting into a strawberry pie made with fruit you picked from the soil yourself, or buying a pumpkin from someone who you know grew it locally. There’s a lot of disconnection from our food sources in this day and age, and choosing farm fresh produce means making healthier choice for our bodies and the environment. Make Barrie Hill Farms a regular part of your meal planning for your own health and the health of our community.